The German auto industry—and Germany at large—is desperately trying to convince local and national governments that diesel vehicles aren’t always dirty, and that they have a place in European cities. To do this, BMW, Daimler, VW and many politicians met in Berlin Wednesday to try to stop the bleeding that is Europe’s mistrust of Germany’s diesel vehicles. The auto industry accounts for 20 percent of the country’s industry revenue and plays a pivotal role in making the country among Europe’s richest and most powerful. 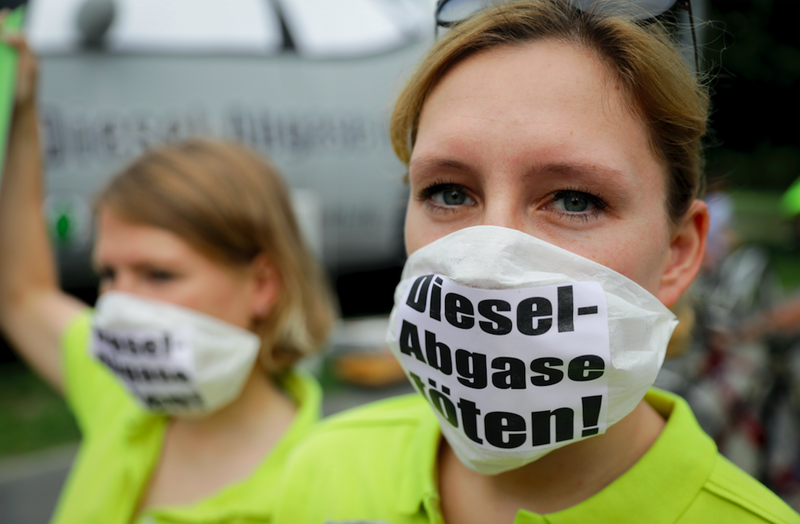 But Volkswagen’s Dieselgate scandal has led to deep distrust of Germany’s automobile emissions. Countries like France and Great Britain are promising to ban gas and diesel cars entirely by 2040. Even some cities in car-loving Germany (like Munich and Stuttgart) are considering banning oil-burners to keep down NOx emissions. With anti-combustion car fervor growing in Europe, Germany is naturally worried about slipping sales. The German federal government invited heads of car companies (like VW, Audi, Porsche, BMW, and Daimler), minister presidents of German states (like Bavaria, Baden-Württemberg, and Lower Saxony), and trade groups (like the Association of the Automotive Industry and the Association of International Motor Vehicle Manufacturers) to Berlin this week for what was called the “Diesel Summit” meeting, according to German news site Der Spiegel. At Germany’s capital, top officials from the car companies and government officials from across the nation discussed ways to improve air quality, and especially to improve national opinion of diesel automobiles. Among the outcomes of the summit were proposed software updates for over 5 million of Germany’s 15 million diesels. German automakers would use these software tweaks to increase emissions controls effectiveness under a wider range of use cases, thus shrinking the so-called “thermal windows” companies have allegedly been exploiting to side-skirt emissions regulations. The update, according to German newspaper Bild, is expected reduce NOx output by approximately 25 to 30 percent, and would cost about 150 euro per car (a cost that would allegedly be absorbed by automakers). It’s worth noting that Der Spiegel says NOx output could drop by 50 percent in some cases, and that the software fix will cost closer 100 euro. In addition, participants in the Diesel Summit promised that the update would yield no disadvantages in fuel economy or other performance metrics. Further discussion at the “Diesel Summit” included an initiative for governments and automakers to provide incentives for owners of older diesel vehicles to trade in their cars for newer, cleaner ones. Der Spiegel reports that Ford has an “environmental bonus” of two thousand to eight thousand euro for those who trade in a pre-2006 diesel and get a new Ford. BMW may also offer up to 2,000 euro. On top of the incentives and software updates, the summit also established a 500 million euro “Sustainable Mobility for the City” fund whose job it would be to modernize city buses and taxis in Germany’s 28 most auto-dense cities. The fund will also be used to improve traffic flow via infrastructure investments like improved bike paths. Half of this fund would be paid into by state and local governments (i.e. taxpayers), while the auto industry would cover the other half. So Germany is in a bind, because one of the most important products it sells is falling out of favor. At the same time, the country’s chancellor is struggling to balance public opinion (many people say she’s been too soft auto companies whose cars pollute excessively) with the needs of the German economy. There’s an election coming up in a month and this whole diesel crisis may even affect the results.